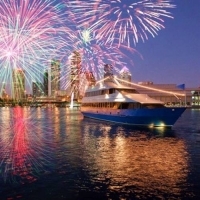 Join Yacht StarShip for 4th of July!!!! Hello Tampa! In case you haven&apos;t heard, the 4th of July holiday is THIS WEEKEND! (seriously where did June go?) Anyways, Lisa here to help you decide what to do on this years 4th of July holiday. Yacht StarShip is getting out their big 600 passenger ship for this weekend! And they are hosting their annual holiday cruise around Tampa Bay. Included in this years spectacle is a buffet with traditional American favorites, an open premium bar for adults and non-alcoholic beverages for under 21, gratuity for buffet and bar, stellar entertainment, and a spectacular fireworks show choreographed to patriotic music. Now for the scrumptious details. The food will include southern fried chicken, pulled pork, char-grilled salmon, prime rib, slaw, potato salad, mixed green salad, corn on the cob, baked beans, macaroni & cheese and apple berry cobbler! YUM! This cruise will board at 6:30 pm the night of the 4th (Monday), and will cruise from 7-9:30pm. The tickets are non-refundable and non-transferable. Adults are $89.95 and children are $49.95. Keep in mind that&apos;s an all inclusive price! To book this cruise you can call 813-223-7999 or head online to YachtStarShip.com. Book now because this WILL SELL OUT!!!!! That&apos;s all for now, but check in later for other things to do in Tampa Bay, and other Tampa Bay area events!